And once again, I’m back! 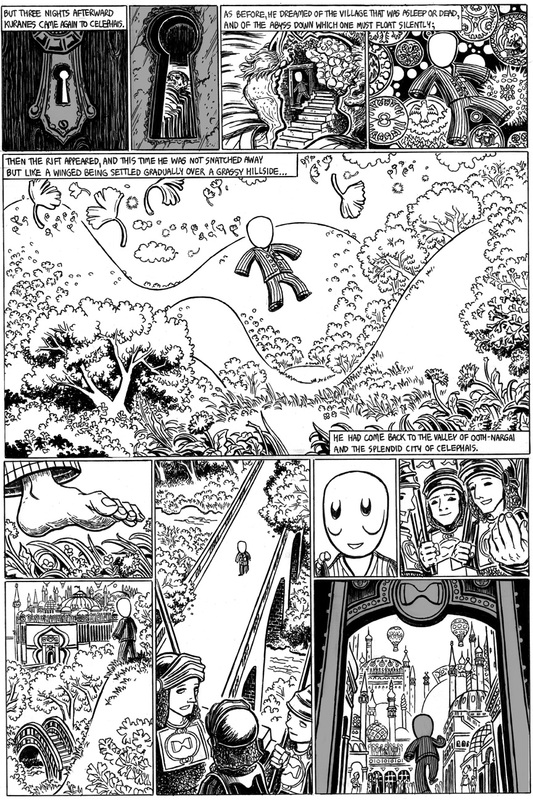 Here’s the new page of Celephais, which was delayed while I was in San Francisco for the King of RPGs 2 launch party. (Did I mention that King of RPGs 2 has a Call of Cthulhu scene?) While drawing this page, I was mostly listening to various pop love songs and to the soundtrack of “Tiny Wings”, an iPhone game I like. I’ve also been looking around for the soundtrack to the old “Little Nemo in Slumberland” video game for the NES, which has a certain whimsical dreaminess to it as well, but I haven’t been able to find it (of course, the game itself was just a Super Mario Bros. 3 clone, and the movie was a mess, but the original comic is wonderful, so anyway…) That said, I don’t want anyone to question my qualifications to also draw scenes of soul-shattering terror. I’m afraid the next Celephais page won’t be up till June 22. I’m working on another art project and I need to concentrate on that for the rest of the week. But hopefully the following page will be just a week later, on June 29. Can it happen? It can happen! Please wait for it, and thanks for reading! If the next page comes out on the 23rd, it would be the best birthday present evar. Is this the last Lovecraft story you’re going to finish before you can start work on your Lovecraft anthology? The scenery in Celephais is idyllic, but somehow the story becomes more ominous with every panel. It does seem to be all about Kurane’s dawning awareness of his own mortality, and his attempts to escape it. At least, that’s my interpretation. Have you ever considered adapting an A. Merritt story? I don’t know why it never occurred to me before; perhaps your images of “The White Ship” brought to mind similar paintings by Hannes Bok, and then Merritt’s “The Ship of Ishtar”. Like Merritt, you seem to be able to conjure up time-lost realms of antiquity which are both wonderful and terrible; vast yet indefinite. Yes, I know–adapting, say, “The Metal Monster” would be an immense project and probably take years to complete! Jason, just a thought–when you get around to doing the book collecting your HPL adaptations, it would be nice if you could include a self-portrait (sitting at your drawing table, naturally). A portrait of Lovecraft working at his desk would be cool, also! I’ve read a bit of A. Merritt, but it’s been a long time — back in college I think. I remember liking them, but I don’t remember much; I have to go back and reread his books and reassess them. Thanks for your patience and support! I’ll be posting before too long!